It’s over 3 weeks since our last Saturday morning allotment visit and we didn’t make it yesterday either. It’s been unseasonably hot in the UK for weeks now and our weekends are such a precious balance of down time versus adventure. Yesterday was the first day of the school holidays and we relished sitting around in the clothes we’d woken up in and having no timescale for eating, dressing or leaving the house. ”Can we go in the car? I do love gardening but it’s so exhausting to walk home after. I wish the allotment was in our back yard”. We watered our plot as soon as we arrived and could immediately see that Dave had been keeping a careful eye on it – the soil had been hoed and our plants were thriving despite the heatwave. I’d expected our lettuce to be completely frazzled but it was vibrant and tasty. Our plot benefits from the morning shade provided by Dave’s blackberry brambles which is another reason why I prefer heading out in the morning. My little Noticer Euan was delighted to find a broken birds egg as we watered the plot. I wasn’t sure what it was but suggested a pigeon egg as we’d found a similar one years ago and that had been Dave’s guess! Euan has been really curious about creepy crawlies since taking part in the #GreatBritishBeeCount – on our last visit he befriended a woodlouse and found it amusing that he could feel his legs tickling his hand as he tried to escape. We picked some of Dave’s gooseberries when we started to feel peckish having sampled Dave’s red gooseberries on previous visits. Freshly grown, sun ripened gooseberries are extraordinary – tangy but sweet and no hint of sugar needed to sweeten them. I was reminded of the gooseberry bush I inherited from Dave’s allotment neighbour when failing eyesight meant he was no longer able to manage his plot. After a brief pitstop Luca wanted to help with the watering again and I remembered we hadn’t fed our tomato plants. They definitely benefit from a liquid feed to ensure they get the right balance of nutrients (potassium and nitrogen thirsty). Dave’s tomatoes are beautifully trimmed and trained up tall sticks. We’ve always gone for a more bushy effect as I never get round to nipping the tops out! You see that watering can, you’ve guessed right, it was pretty much empty by the time Luca had dragged it back to the plot all by himself. You’ve got to admire toddler determination but it can be maddening to be on the receiving end of a ‘‘No Mummy help” when you can see how it’s going to end up! We left the plot with a week’s worth of lettuce and it kept beautifully in the fridge after being rinsed and shaken. I always presumed washing lettuce as soon as you got it home, and well in advance of when you’d use it, would make it deteriorate quicker but Henri’s advice to run it under the tap and store it upside down (if whole) in a plastic bag has served me well. 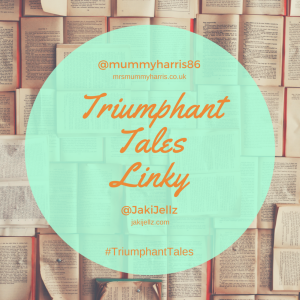 I’m also sharing this post with Sophie at Oldhouse in the Shires and Ann from Gardening Limited who co-host the fab monthly gardening linky #MyGloriousGardens. If you write a gardening blog we’d love you to come and share your stories with us. 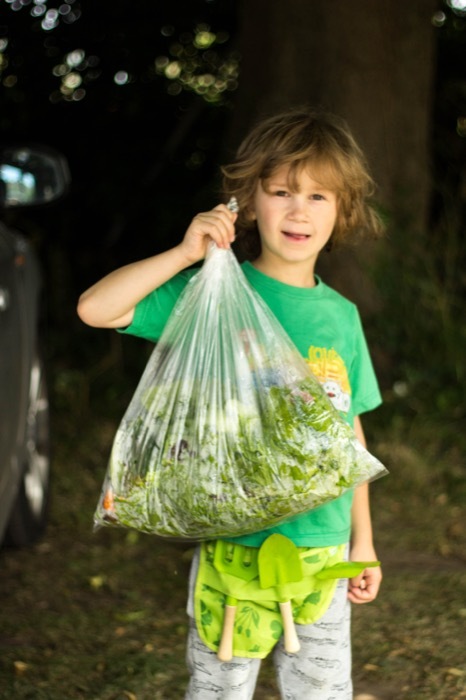 If you liked reading about our allotment adventure our other gardening with kids posts are here. Feel free to pin or share if you enjoy them. You can find me on Pinterest here. 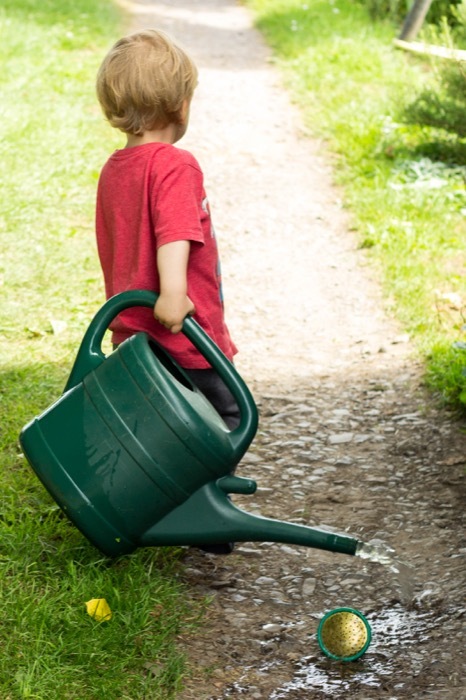 My daughter likes to ‘help’ with the watering too – I always sneakily water whatever it is she’s been tasked with and treat whatever she manages to give it as a bonus! Gosh yes that’s absolutely the tactic. 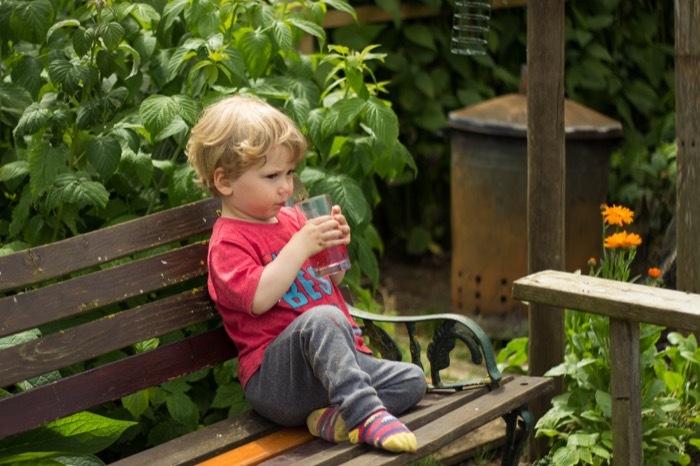 Big enthusiastic ”oh you watered the shoe, use that last bit on the plant there then!” Thank you for commenting, it’s always lovely to hear from other growers striking the balance between sharing the joy of gardening with kids and pulling your hair out! Hi Nic, I can imagine the trek to the allotment in the recent heat isn’t pleasant, but those veggies are payback x 2. It is lovely that your boys have an interest in your allotment. 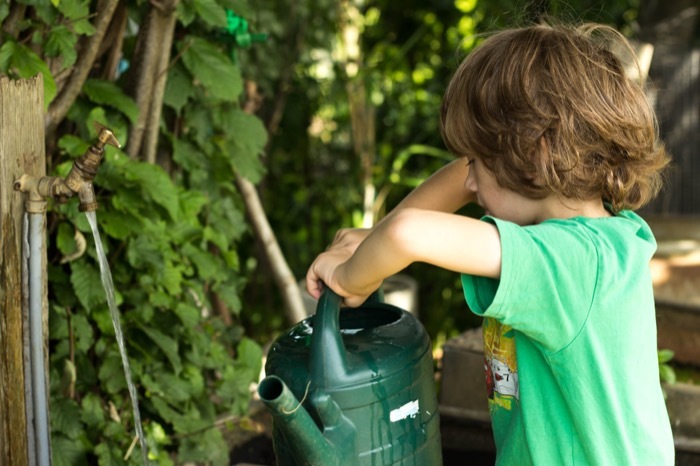 I love that photo of Luca dragging the watering can, it’s a classic and I am surprised you managed to water any of them… My Dad used to have lovely gooseberry bushes when we were growing up and pinching them and eating them straight from the bush was something we loved doing. Something we sometimes paid for with dicky tums. Thank you for popping by and linking up with #keepingitreal. Keep up that watering, no sign of rain any time soon! You reminded me of when my daughter used to help me with the watering! Aged 18 months, she thought it was hilarious to accidentiy hose me too! Such a cute post! Love the pictures and gooseberries! Yum. I haven’t planted any yet but plan to make a new soft fruit area at some point. I do have red currants but the birds got to them before I could bet them! It looks like you and your children have a lot of fun in your garden. You must be very dedicated to it if you spend 25 minutes walking to it! I heard about your heatwave and hope it starts to cool down soon! 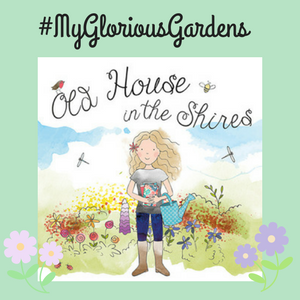 Thank you for sharing on the August #MyGloriousGardens link party! Good to get kids having fun and activities without forcing them to do so. Also it will help to make good real memories with family members or friends when they grow up. What a great idea?!! I like your idea very much. If your children work in garden,Our children mind is so joyful and refresh-able. I think your idea is great and very helpful. Lot of Thanks you for this wonderful post.